Winter days are short and the nights are long in the Pacific Northwest. The sun sets before I’ve even made dinner and I have to wake the kids up for school in the dark FOR MONTHS. It just drags you down after a while. Up here at the 47th parallel, we need coping mechanisms to remind us that these short, cold days won’t last forever. That the sun will come back. Strong coffee helps, but my real go to? Spring vacation fantasies. I need something warm and sunny to look forward to that won’t equate to cashing in a college fund. My favorite destination? Moab, Utah. Why Moab, UT? If your focus is outdoor adventures with stunning scenery, make sure southern Utah’s red rock country is on your bucket list. The small town of Moab (pop ~5,300) is the gateway to massive red rock formations in Arches National Park and, 30 miles southwest of town, Canyonlands National Park features mesas and buttes carved by the Green and Colorado rivers. 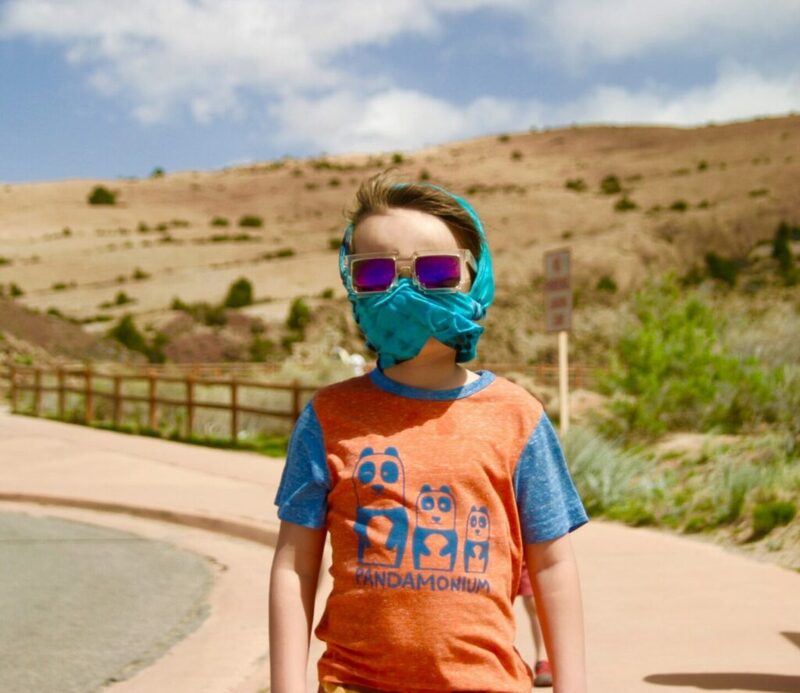 The town and the surrounding parks (especially Arches, in my opinion) are very family friendly, with lots of easy short hikes. Last spring, I traveled there with my kids (4 and 7), and my 74-year-old mom, and there was plenty to do for all ability levels. 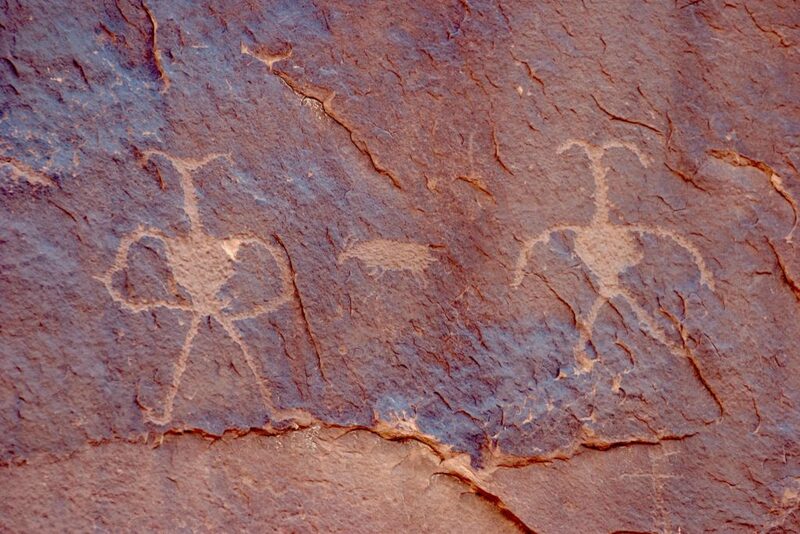 Many of the hikes in the Moab area also feature Native American rock art and prehistoric fossils! Getting there: If you do not live close enough to drive to Moab, UT (and most of us don’t) then your closest major airport is Salt Lake City. It is about a 3.5-hour drive south from SLC to Moab. If you fly into Salt Lake and take US-6 south to Moab, break up the drive by stopping half-way at the Prehistoric Museum in Price. This “small town” museum is a real gem! It houses fantastic dinosaur skeletons and displays of local prehistoric Native American tribes. Hiking:The hiking trails are boundless and varied. You can stroll short, easy trails to incredible rock formations and vistas, or plan a multi-day backcountry trip into the heart of the labyrinthian canyons, and everything in between. 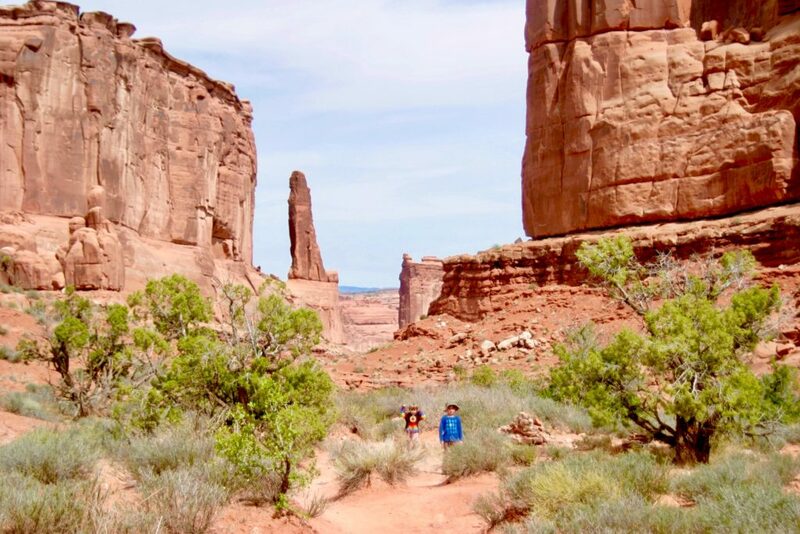 Moab sits central to two national parks – Arches and Canyonlands – as well as state parks like Dead Horse State Park and numerous other state and federal public lands. 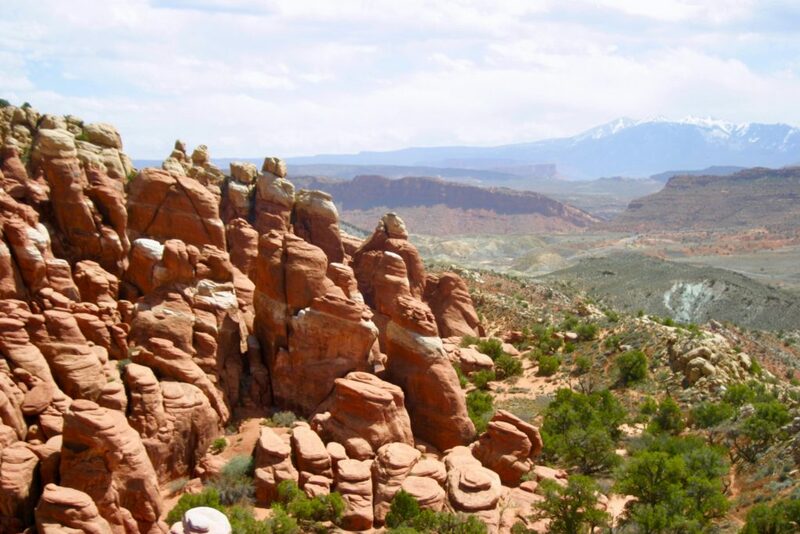 Dinosaur Fossils and Tracks: The rock formations in the Moab area hold an abundance of dinosaur fossils, including several well-preserved track sites. The Mill Canyon Dinosaur Trail is close to town and a fairly easy walk with excellent interpretive signs. It is a wonderful experience for any fossil hunter to be able to touch real fossils embedded in rock. Petroglyphs Native American rock art: Utah is home to some of the best examples of Native American rock art to be found anywhere. Many petroglyphs and pictographs, originating from several distinct eras, have been well preserved by Utah’s arid and remote landscape. Quite a few sites are really easy to see for yourself, located right off roads and main trails. Weather: Spring in the desert is generally warm and sunny but, as with spring anywhere, the weather can change quickly, so be prepared. On the drive from Salt Lake, we encountered snow flurries – a rather magical sight in the desert. 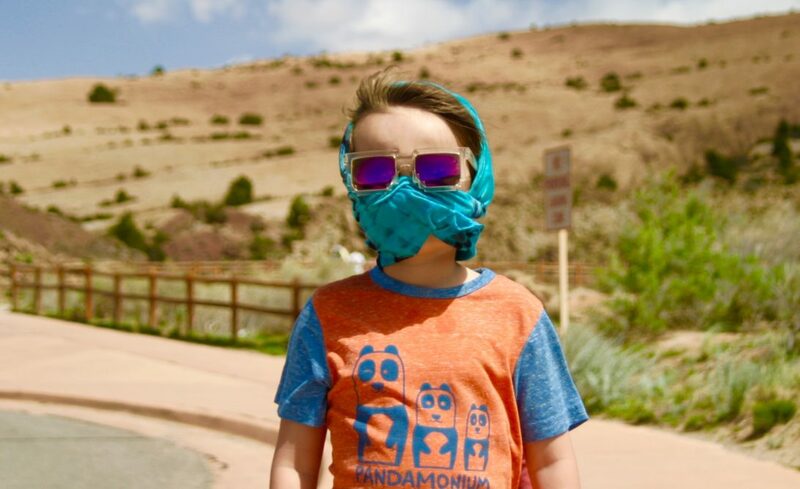 During our time in the Moab area, we had an 80-degree day which felt blistering us (coming from low 40’s and rainy Seattle), a lovely 70-degree day which still provided at least one mild sunburn and a 20mph windstorm. BTW windy days in the desert = sandstorms. I will never be caught out in a desert without sunglasses and a bandana again! Zax Restaurant and Watering Hole (96 S Main) is all around good family dining with friendly service and a quality selection of grub and adult beverages. Zax has an all you can eat pizza bar with really good pizza. Need I say more? Moab Garage Co. (78 N Main) makes fantastic ice cream with flavors hand mixed and made to order! I hear the food is even better. When I visit smaller cities and towns, I love to seek out the local organic/health food/co-op for my groceries. Moonflower Community Co-op (39 E 100 N) has been a staple of the community since the 70’s. I always stop here when I’m visit Moab. The Moab Info Center (25 E Center Street) is a fantastic resource for planning your outings. The staff is incredibly knowledgeable and helpful with directions, maps, and suggestions for places to explore, eat, or shop. Rotary Park (680 Millcreek Drive) is located on Mill Creek Drive and offers a shady, quiet refuge from the desert sun. This 3-acre park includes creek access, picnic areas, and a musical playground featuring many large musical instruments like chimes, marimba, and drums. A great stop for little kids. For myself I’ll take Moab, Utah. I don’t mean the town itself, of course, but the country which surrounds it — the canyonlands. The slickrock desert. The red dust and the burnt cliffs and the lonely sky — all that which lies beyond the end of the roads. Not even one page in and I was hooked. I had to see this land for myself. Several years after first reading Desert Solitaire I took a road trip to Moab with friends and it did not disappoint. Since then I have been in love with the dramatic red rock landscape, so vastly different from the mossy, green Pacific Northwest where I grew up. 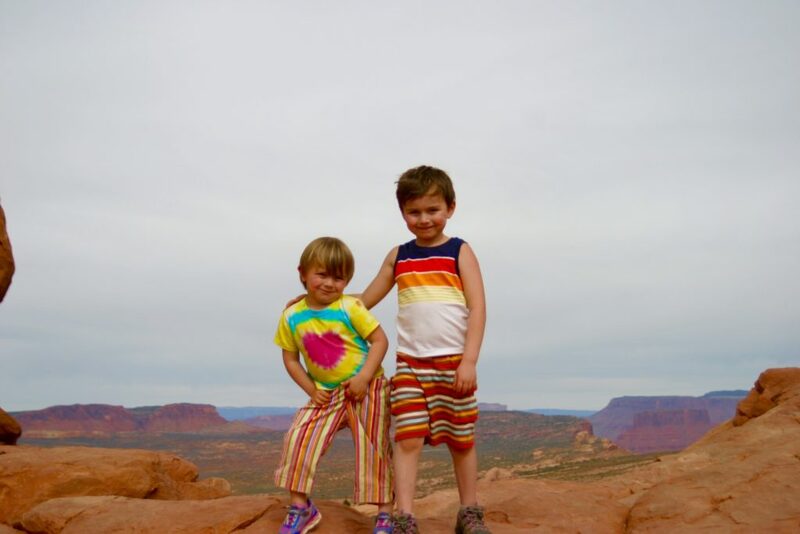 My kids were just as enthralled, scrambling up Slickrock into the cradle of a giant wind-carved arch. If you go to Moab, UT, take a copy of Desert Solitaire. Read it before you go, or on the way there. It’s an essential primer for falling in love with a red rock desert. I still have my yellowed, dog-eared copy. I’d lend it to you, but it’s 29 degrees and windy here so I’m feeling the urge to read it again. Right now.